PHUKET: Governor Chockchai Dejamornthan has warned officials who ride motorbikes in Phuket that their superior officers will be held responsible if they are caught not wearing helmets while on the roads. The warning came yesterday, when Phuket Provincial Police Commander Maj Gen Teeraphol Thipjaroen revealed that Phuket was the worst province in Southern Thailand – and second-worst in the country – for motorbike riders not wearing helmets. Governor Chockchai levelled the stern warning at officials at his monthly meeting with high-ranking officers at Provincial Hall yesterday (Nov 29). “All motorbike riders in Phuket should wear helmets 100 per cent of the time for their own protection,” he said. “Government officials caught not wearing one will be punished regardless what good work the person has done for his or her office. “If any official is found not wearing a helmet, that official’s superior will be held responsible,” he warned. Gov Chockchai also ordered a zero-tolerance of any motorbike riders not wearing helmets when visiting government offices. “The same applies for all government office premises. All people who come to government offices must wear helmets,” he said. However, Gov Chockchai called for law enforcement to rely on public relations to encourage the general public to wear helmets while travelling on motorbikes. “We prefer to rely on public relations by give them information and make them understand how important it is to wear a helmet while on Phuket roads,” concluded Gov Chockchai. 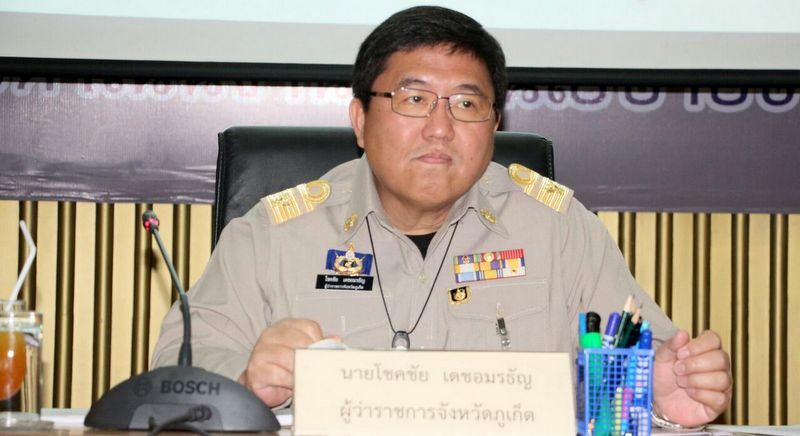 Phuket Police Commander Maj Gen Teeraphol said that Phuket was the worst province in Southern Thailand for motorbike riders not wearing helmets. “We’re the second-worst province in the country,” he said, without clarifying which province was the worst. “We find a lot of motorists not wearing helmets at night. However, officers not on patrol are often at traffic checkpoints and on the lookout for these people. Motorists not wearing helmets are stopped and fined on spot,” Gen Teeraphol said, explaining the Royal Thai Police version of public relations. “The majority of this type of law-breaker are teenagers, so we have asked educational institutions to cooperate with us by educating their students on traffic law and enforcing them wearing helmets,” he added. Meanwhile, Chalong Police have been praised on Facebook for one of their officers making two Thai female high-school students run laps around their motorbikes instead of fining them for not wearing helmets. The praise follows Facebook user Lek Sparrow posting a video of the incident when the students were caught not wearing helmets on Chao Fa East Rd near Chalong Circle. “Lek” said that he admired the officer for not fining the girls, but instead disciplining them and lecturing them on the importance of wearing helmets. You should also try to at least wear a jacket as well. malczx7r \"ok then another person decides what he wants to do\"
And what is wrong with that so long as he does not harm others by his action? Try Googling NAP - Non Aggression Principle. \"and before you know it everyone is making their own rules up\" Delete \"rules up\" add \"decisions\". There that has fixed it. malczx7r, do yourself a favour, read everything I wrote, regarding paraplegia, and quadriplegia, it wasn't only about deaths. Your comment "i bet you could count on one hand the deaths caused by a helmet compared to deaths when not wearing helmets" is purely speculative, unless you can show proof. Andy, the people who set out the laws decide, that's why they have passed a law to wear a helmet! I don't ride a bike here, i certainly don't drive drunk, smoking or on my phone like I see the rest of the people, as for you deciding, ok then another person decides what he wants to do and before you know it everyone is making their own rules up, how is that going to work?? Rori what a load of tosh, i bet you could count on one hand the deaths caused by a helmet compared to deaths when not wearing helmets, the same argument some said for not wearing seat belts! Its true they cannot be responsible for what their subordinates get up to after hours but to suggest (swerve) a law enforcement officer would discipline another for not wearing his helmet in LOS is simply laughable! War on low income people is how it should read- who are easy marks for police to just stand around and collect. This law has no effect whatsoever on anyone's safety other than the person who chooses to not wear a helmet. If public welfare really is the impetus,(doubtful) better to spend time and resources to enforce traffic laws on reckless driving like speeding and tailgating. Kurt: "The point is that no superior official can be held responsible for his staff doings in their free time. Period." You need to get someone to proof read your ramblings ( and correct your English )before you comment, because you are stating that if an off duty policeman is caught without a helmet in his free time he cannot be disciplined by his superior officer. If you still don\'t understand then I am sorry I can\'t help further. First they came for the communists, but I wasn\'t a communist and so on. So i fail to see what this quote has to do with the law. Seems thai public on Phuket are a bit fed-up with RTP. Parking ticket was cancelled, that says something. The next thing, defamation charge, is just to eliminate RTP's loose face. A nice case for the Phuket Ombudsman to look into. swerve "It's the law" I suggest you check out that famous quote by Martin Niemoller. malczx7r "Very intelligent Andy" Thanks. Swerv, swerv, again you miss the point of the comment. The point is that no superior official can be held responsible for his staff doings in their free time. Period. Further I advice you to have a look at Chalong circle during RTP 'ticketing hours'. Than you see that only tourists on rented motorbikes a stopped and fined. Kurt: Again, think first before saying something. Is much wiser? You are the one who should think first before writing. A policeman is a government official whether he is on or off duty. And yes, Police do hand out tickets to government officials. I wish you would stop making ridiculous statements. And: a funny statement of the governor ( law wise)to declare that official's superiors will be held responsible if their staff not wear helmet. Impossible. No Official's Superior is responsible for what his/her staff is doing in their free time. Guess the Phuket governor was not legal-advised before he expressed this statement to the world. Funny remarks of a police officer that kids have no money. All the kids have smartphones/iPhones. If they have no money to pay the fine, than confiscate their smartphone for 4 weeks. After 4 weeks the kids can come up with the money for the fine and get their phone back. Andy: The answer is...it's the law. As is wearing seat belts. Anyone who rides a motorbike without a helmet is an idiot. Drive a million miles an hour up the wrong side of the road, straight through red lights, swerve all over the lanes, don't indicate, cut off other motorists at will, drive way too slow, don't give way when you should, but you must wear your helmet! What business is it of anyone apart from me and my family whether I choose to wear a helmet or not? And before anyone starts quoting medical costs to the state I say, "two wrongs do not make a right." And where does this stop? 20mph speed limit everywhere. Or 5mph? That would make the roads safe.